Angelina tearoom is a unique place for enjoying the famous hot chocolate drink and scrumptious Mont Blanc cake, whose recipes have been a well-guarded secret for centuries. The famous “African” hot chocolate is composed mainly of three kinds of African cocoa from Niger, Ghana and Cote d’Ivoire, all of which have been carefully selected. The secret recipe for this chocolate mix is especially out together for Angelina. 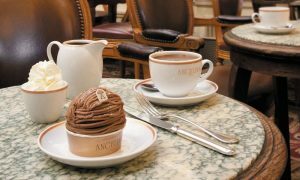 The combination of three different types of chocolate provides Angelina’s hot chocolate its unique and exceptional taste. Mont Blanc is yet another treat that is offered at the Angelina tea house. This iconic pastry combines meringue, light whipped cream and chestnut paste vermicelli, to turn this dessert into a delightful one. The Mont-Blanc’s unique and unrivalled recipe has made it into Angelina’s famous landmark pastry since 1903. You can also enjoy the famous Angelina delicatessen range, which is available in all Angelina boutiques as well as in other high-end food stores. Among these several sweet treats is the smooth and tasty Angelina Chestnut Cream. The range of Angelina’s delights also counts eight varieties of teas including the “Melange Angelina”, confectioneries, spreads, caramels and jams. Angelina tea house is the perfect place for people who want to tantalize their sweet tooth with delectable desserts and wonderful treats. Do not forget to go to Angelina Tea House, during your next visit to Paris, so that you can enjoy the famous Angelina’s delicacies and even take them home with you.